Construction paper is a must-have for school and home craft projects. Available in handy, multi-color packs of standard sized sheets, Crayola Construction Paper adds vivid color to artwork, classroom decorations, bulletin boards, and more. 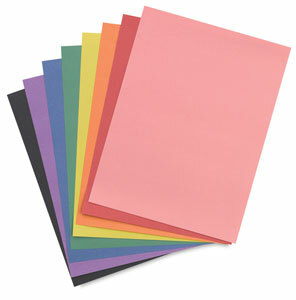 8 Colors, 96 Sheets — Includes 12 each of 8 colors, including Yellow, Pink, Red, Violet, Green, Blue, Orange, and Black. 9" × 12" (22 cm × 30 cm). Giant Construction Paper w/ Stencils — This pack of 12" × 18" (30 cm × 45 cm) construction paper sheets gives kids the space to let their imaginations soar in a big way. 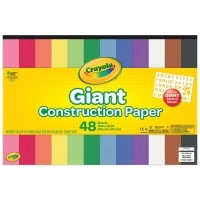 This pack includes 48 sheets of colored construction paper, six each of Black, Blue, Green, Orange, Pink, Red, White, and Yellow, plus an extra-large stencil that helps kids draw big letters, numbers, and shapes such as a heart, a balloon, a butterfly, or a rocket ship.